It's the first of the month!Vote Vote Vote to see the sketch of page 3! My goal is to stay in the top 100 at TWC this month, so they'll be a new vote incentive every update. Remember you can vote for as many comics as you want, just once per comic per day. Like I said on Wednesday, taking a page out of JJ Abrams' book when it comes to the order of the scenes in this arc. Meaning, it will be jumping around a lot for those of you who are not LOST fans. Now the question is: what did Colbey do THIS time? 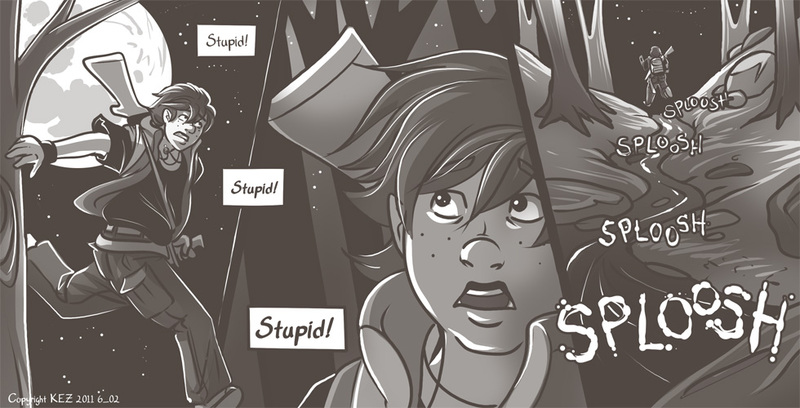 To learn more juicy tidbits about Colbey, and Peter, and specifically, what happened between the END of Arc 5 and this scene right here, you can buy this $5 11-page Arc 5 extension! It's extra, you don't need it, but what is revealed there won't be revealed here for weeks. And it's seriously cool. Each page has 1 illustration and is narrated by Colbey. I really can't believe how many people have bought this! Thank you! All proceeds go toward getting Arcs 2-5 printed for Penguicon at the end of April. It'll be about $500 to get 25 or so copies of each (100 total), and with what I've already saved plus your guys' help, I'm already way past the half way point! And let me make this clear again: this story is EXTRA. It is not required to understand events after. BUT! Some pretty cool things come out in the open, and it will serve to make the reading experience of the comic better. FIVE DOLLAH FIVE DOLLAH! Click the button above. Colbey was updated on Monday! Another $5 gets the gun inked and then on to colors. When I'm done this will be a high-quality downloadable wallpaper for all. Click on Colbey to participate in that. Here's the results from the WTF phase. Stumble Upon! Do you have the toolbar? Xanthine: Hmm, the present, eh? We'll see! mvmarcz: I leave the spoilers on the sketch but don't always translate them to the finished page. Because I am mean like that. Tigershark: The time line in this arc will become clear in time, but I'm gonna keep everyone in the dark as long as possible!